Nasdaq-listed Infosys has said it was the failure of the state government in fulfilling the agreed conditions that led to the delay in executing its 448-acre IT Special Economic Zone project in Hyderabad. 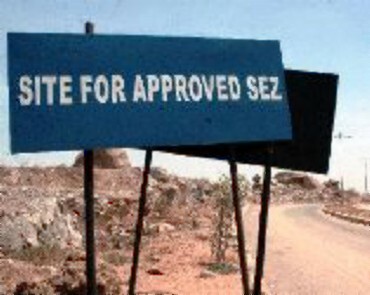 In its reply to a notice served by the Andhra Pradesh Industrial Infrastructure Corporation (APIIC), the company said while its SEZ got notified in October 2007, Phase I was to be completed by 2008. 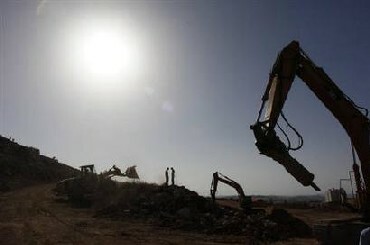 However, environmental clearance was given in May, 2009 and water connection to the site came only in November 2010. The state government's nodal agency had sent the notice to the country's second largest software company, in April, month seeking an explanation as to why it had not completed the project according to the timelines agreed upon in the MoU with the government in May, 2007. "Blaming the government for the project delay is one thing. We have asked for a detailed plan as to how they are going to utilise the entire extent of land," BR Meena, vice chairman and managing director of APIIC said. 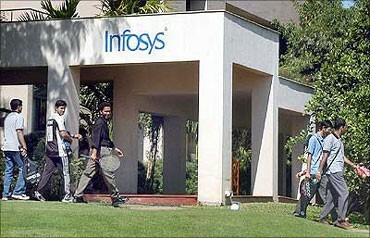 He, however, said Infosys was yet to show its land use plan. The government, under then chief minister YS Rajasekhara Reddy had invited Infosys co-founder NR Narayana Murthy to set up its largest campus in the city following adverse remarks by former Prime Minister HD Deve Gowda on the company's land acquisition plans in Karnataka. APIIC had allotted the land at Rs 12 lakh per acre. Under the MoU, Infosys agreed to invest Rs 400 crore (Rs 4 billion) within three years in Phase 1 and proposed to invest another Rs 300 crore (Rs 3 billion) in the second and third phase to create employment for 25,000 over a ten-year period. Infosys HR director Mohandas Pai, who recently quit the company, had met chief minister N Kiran Kumar Reddy in February this year and sought government's help in laying approach roads among others to speed up the work. While things stood where they were for the Infosys, the APIIC was also sending notices to other companies that were delaying their projects. It recently cancelled the land allotted to Moser Baer, which failed to start its solar photovoltaic project on 100 acre near Hyderabad. Similarly, it withdrew 1,700 acre given to Unitech in Visakhapatnam as the company could not implement its 'Knowledge City' project even after paying Rs 200 crore (Rs 2 billion) towards land cost. The corporation had earlier sent notices to Brahmani Infratech Limited, which took 250 acre near Hyderabad airport for setting up an IT SEZ project. 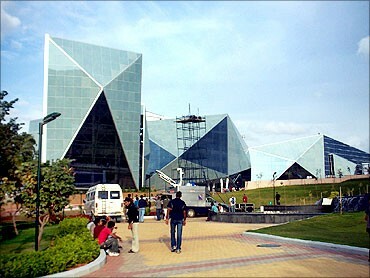 "The company has so far invested about Rs 230 crore (Rs 2.3 billion) in the campus. We have committed a further investment of Rs 750 crore (Rs 7.5 billion) of which Rs 350 crore (Rs 3.5 billion) work is in progress," said an Infosys spokesperson, who is also in charge of the Hyderabad project. According to him, the company plans to complete Phase 1 by June 2012 and have up to 6,500 employees by March next year. 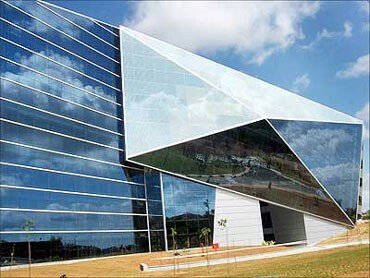 It would further ramp up to 14,000 people by March 2013 with a total investment of about Rs 980 crore (Rs 9.8 billion). Ajay Mishra, principal secretary - Infrastructure and Investments, who also holds the additional charge of IT&C, said it was too early to take a stand on the issue. "The government will examine all aspects after we receive the report from the APIIC," he said. A senior official of a global consultancy firm based out of Hyderabad, however, said there could be lapses from both sides. "Infosys already had a campus in Hyderabad, which means it is better placed to deal with government authorities for securing approvals. I can cite examples of projects where FDI was involved, and people from outside the country were able to get government support in executing their projects in remote parts of the state, on time. Therefore, was Infosys slow on this project?" he questioned. Meena said if the company failed to respond quickly, he would send his report to the government and not wait for its land use plan. On its part, the company said it was fully committed to AP where it was the largest employer in the IT space with 17,000 people working at both the campuses in Hyderabad. How will the car loan scenario impact you?